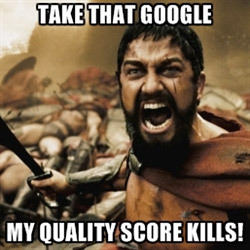 I tried to find 300 PPC links for you, but got distracted by Gerard Butler’s abs. Does PPC excite you? Yeah, I didn’t think so. But I bet I know what does excite you… A Quality Score of 10, a CTR of 15% and a Conversion Rate that makes your boss pee her pants. There’s only one way to impress with your PPC results and that’s low spend for high return. Want to know the trick to get there? Use great landing pages to drive down your Cost-Per-Click. Many advertisers don’t realize that PPC data can give you a huge amount of insight into your business. Besides the obvious PPC “clicks”, the benefits seep into brand exercises, landing page performance, USP insights, savvy target market language and product popularity. A great case to make to those reluctant to the long-term value of PPC. 2. Does Your PPC Budget Match Your Conversion Optimization Budget? This is an awesome post by Howie Jacobson, one of the best I’ve read in fact that tries to describe the value of landing pages to your PPC campaign. “It’s better to plant a $10 tree in a $100 hole than a $100 tree in a $10 hole.” It makes perfect sense, trust me, get reading. A sucker for benchmarks? This post is a great reference. For instance, did you know that the average click-through rate for an ad in the first position is 7.94%? Also, if you’re an ultra PPC nerd, this post can help you put together that trivia night you’ve been dying to host. If you’re satisfied with nothing but the best, voila! Here’s a list of the top 100 blogs on Search Engine Marketing. Break out your RSS Reader and get subscribing. “Keywords are the lifeblood of the PPC industry” so if you can’t answer “what makes a good keyword?” in less than 30 seconds, chances are your PPC campaigns would be a whole lot better with a little research. Get your step-by-step guide here. Are you still holding out on turning your campaigns on to mobile? A quarter of all paid clicks on Google will come from mobile devices. Yeah, hop to it – Here’s how. If you use Geo-Targeting in your PPC campaigns (and you likely should) here are the latest changes to come to AdWords; Canadian Postal Codes, finally, eh? (I can say that, cause I’m Canadian ;), city-level targeting and location extensions to new countries. Get the skinny. The jury is in; The SEO & PPC kids have kissed and made up. This post is the Search Marketing romance novel of the year… Ok, month. Find out why they’re better together and how to achieve their perfect harmony. “ZMOT?” yeah, it was a new acronym for me (tsk tsk, I know), but just in case; It’s the moment when a person first begins to contemplate a topic that will inevitably lead to a purchase – The Zero Moment of Truth. In other words, you want to leverage this moment, and the best way to do that is through findability, relevance and credibility. I’m not sure AdWords has anything to worry about, Facebook search is notoriously horrible and well, it’s kinda Google’s “thing”. It’s still interesting that Facebook is rolling out their own “Sponsored Results”. Get the lowdown. Bootstrapping and PPC don’t often go together but that doesn’t mean you can’t rock your paid campaigns. Avoid the “money-sucking traps” along the way and you’ll be juuust fine. While little pandas and penguins with deadly weapons are hilarious, the point is that people searching the internet with high commercial intent are most definitely clicking on PPC ads and they are converting to sales. I bet if you implement 10 of these tips, you’ll seen an improvement in your PPC performance. Get ‘er done. Do all 54, and you probably have OCD. Read a case study of just how drastically landing pages can improve performance and conversion rates. PPC accounts can go sideways fast. There also isn’t always the time to dig into the problem at the exact moment that they issue is realized. These are 6 tips that can be used to quickly find problem areas where you can focus your efforts on improving performance. “Our conversion rate increased as our average position increased in our client’s account. Based on this data we had a simple directive. To climb all the way to the top of the entire Internet: bid higher.” When in doubt, just keep bidding. It’ll make all the difference in your ad testing. So there you are. You’re all set to go rock your PPC. Just remember to use a landing page.